Ever since Aleksandr Solzhenitsyn published his magisterial three-volume history of the Soviet concentration-camp network, ”The Gulag Archipelago,” in the early 1970’s, the grim details of life in what he called the Soviet sewage system have been well known. From arrest by the Soviet secret police through interrogation, to deportation and hard labor, the life-and-death cycle of the gulag is a familiar story. Other witnesses, like Varlam Shalamov and Evgeniya Ginzburg, have also brilliantly described prisoners’ constant struggle against hunger, cold and disease. So a great deal of what Applebaum writes about in ”Gulag: A History” has been told before. But that does not lessen her achievement. When Solzhenitsyn’s volumes first appeared they had an enormous impact. Yet he soon fell from favor, dismissed by some as an anti-Communist crank, by others as a nationalist anti-Semite. As documents from the Soviet archives have now shown, much of this defamation campaign was financed and encouraged by the K.G.B. But the attacks had their effect: a group of so-called revisionist historians, who dominated the study of the Stalin years in the United States and Britain during the 1980’s, waged a war against the portrayal of the Soviet Union by Solzhenitsyn and other anti-Soviet memoirists. Instead of the slave empire, these historians stressed the country’s rapid economic development and urbanization under Stalin, which supposedly fostered widespread support for the regime. None questioned the existence of the gulag. Rather, they minimized its place in Soviet life and denied that the population as a whole was ever terrorized. Applebaum’s book weighs in heavily in support of Solzhenitsyn on almost every point, and her account is backed not only by a careful use of the vast memoir literature but also by a thorough mining of the long-closed Soviet archives. Most important, she supports Solzhenitsyn’s central argument: that the gulag was not some incidental Stalinist accretion to Lenin’s visionary concept of Socialism. The cancer of police terror was embedded in the original DNA of Lenin’s creation, ”an integral part of the Soviet system,” in Applebaum’s words. Under Lenin, the first concentration camps were created; the first mass executions were carried out. He bequeathed to his successor a well-functioning police state. Particularly useful is Applebaum’s account of the camps during World War II. It was precisely at this time that the system reached its peak of lethality. Fully a quarter of the inmates perished during 1942, but the appetite of the security forces was so insatiable that the gulag’s population dropped less than 20 percent. Following the war, whole new categories of inmates flooded into the camps: German P.O.W.’s, anti-Communists from the western borderlands or from the new Soviet empire in Eastern Europe. Little known in the West, some 600,000 Japanese troops fell into Soviet hands, forced to labor for years after the cessation of hostilities; only a fraction ever returned home. Stalin also punished with deportation entire nationalities — Chechens, Ingush and Crimean Tatars notably — ostensibly for collaboration with the Nazis but, in fact, Applebaum argues persuasively, to eliminate nationalist resistance to Moscow. One great difference distinguished the Soviet and German systems: there was no Soviet equivalent of the death camps. People sentenced to death in the Soviet Union were generally shot before entering the camp network. Applebaum estimates these victims at just under one million during the Stalin years. Instead, Soviet prisoners were expected to earn their keep by contributing to the creation of Soviet Socialism. They mined gold, felled timber, dug canals or lay rails, most often in harsh areas to which free labor could never be enticed. By the outbreak of war in 1941, the gulag was the single largest employer in the world. Yet the Soviets never managed to make it pay for itself. Leon Trotsky had once defiantly stated that it was ”the worst sort of bourgeois prejudice” to call slave labor inefficient; such labor could contribute mightily to the growth of the Soviet economy. Lenin believed him, as did Stalin — with even greater zeal. Defenders of the Soviet system have all too often played Stalin’s game, excusing — or, rather, ”explaining” — the gulag as a direct descendant of the czarist Siberian exile system. But Applebaum’s numbers tell their own story: on the eve of the 1917 revolution, under the czar, only 28,600 convicts were serving sentences of hard labor, compared with the millions committed to the gulag under Lenin and Stalin. At some point numbers matter; quantity becomes quality. It is simply wrong to maintain that the gulag was nothing more than a modernized version of its czarist predecessor. In the end, bourgeois economic realities defeated Bolshevik will and ruthlessness. Projects created with slave labor proved to be shoddily built and inefficient. One notable Stalinist showpiece, the White Sea canal, was designed to allow warships and commercial vessels to pass between the Baltic and the White Seas. Perhaps 25,000 people died digging this canal, yet despite the enormous human cost the canal was too narrow for warships; only shallow draft boats could navigate its course. Touted at the time as one of the great achievements of Stalinist planning, it stands instead as proof of its titanic moral and economic failure. 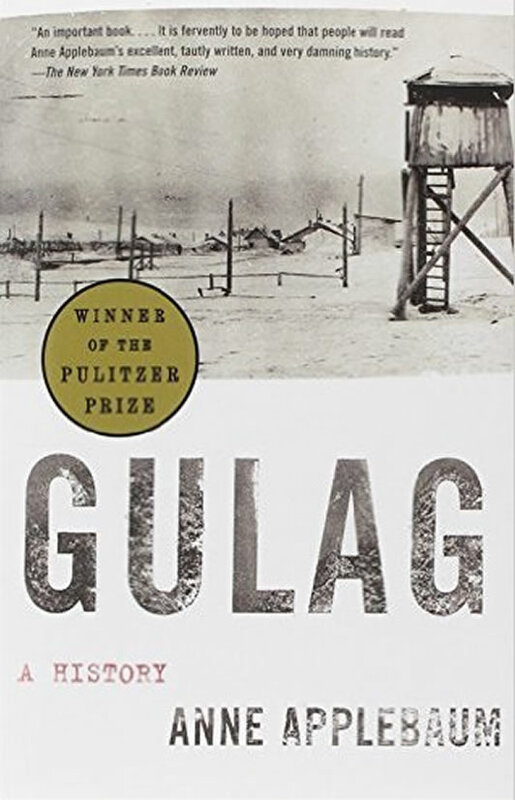 Applebaum gives due consideration to the post-Stalin years of the gulag and to the way the memory of this vast crime against humanity has played out since the Soviet Union’s collapse. It is all too easy to assume that Stalin’s death in 1953 brought an immediate end to the camp system; in fact, it persisted and, though it wound down dramatically during Khrushchev’s thaw, did not finally disappear until well into the Gorbachev years. A brave but small band of Russians, notably the organization Memorial, commemorates the victims of the gulag. But most of their countrymen seem uninterested. The revelations about the crimes of the Stalin era have all come too late, and life today in the former Soviet Union is so hard. Significantly, there have been no trials, no truth and reconciliation commissions. Many of the mass graves have been unearthed, but these attract little notice in Russia and scarcely more than a paragraph in Western newspapers. Irreconcilable versions of the past contend for the current Russian soul. An astonishing number of Russians — perhaps as many as 15 or 20 percent — reject Memorial’s documentation of the terror and view Stalin as a positive historical figure. Applebaum cites Russians saying that the gulag was somehow a historical necessity; that without it Russia could never have tapped the vast resources of the Far East. Most worrisome, Russia’s current leader is a product of the unrepentant and largely unreformed F.S.B., successor to the K.G.B. The talk in Moscow is of restoring the statue of Feliks Dzerzhinsky — the first head of the secret police, and a man who can justly be called the Patriarch of the Gulag — to its place in Lubyanka Square, right in front of the headquarters where so many innocent Soviets were swept into Solzhenitsyn’s sewer system. This would be a historical obscenity. It is fervently to be hoped that people will read Anne Applebaum’s excellent, tautly written and very damning history. Even more fervently, one hopes that it will soon be translated into Russian. Inside the Dark: Applebaum’s Gulag.